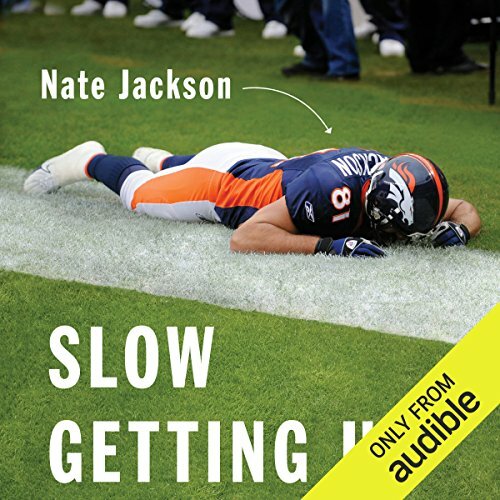 Nate Jackson’s Slow Getting Up is an unvarnished and uncensored memoir of everyday life in the most popular sports league in America - and the most damaging to its players - the National Football League. After playing college ball at a tiny Division III school, Jackson, a receiver, signed as a free agent with the San Francisco 49ers, before moving to the Denver Broncos. For six seasons in the NFL as a Bronco, he alternated between the practice squad and the active roster, eventually winning a starting spot - a short, tenuous career emblematic of the average pro player. Drawing from his own experience, Jackson tells the little-known story of the hundreds of everyday, "expendable" players whose lives are far different from their superstar colleagues. From scouting combines to training camps, off-season parties to game-day routines, debilitating physical injuries - including degenerative brain conditions - to poor pensions and financial distress, he offers a funny, and shocking look at life in the NFL, and the young men who risk their health and even their lives to play the game. ©2013 Nate Jackson (P)2014 Audible, Inc.
Really enjoyed this book. Having seen my buddies go through this grinder after college, Jackson describes its eloquently and spot on. Thanks for writing the book Nate!! A great honest (apparently) and rich story of the journey including hopes fears joys and disappointments. What made the experience of listening to Slow Getting Up the most enjoyable? You can't help but root for Nate Jackson, who comes across as an unusually self-aware athlete in this engrossing and hilarious book. He's not a superstar and he knows it. But he's a survivor and we benefit from his observations and analysis. What other book might you compare Slow Getting Up to and why? This is a much more intimate book than "Collision Low Crossers", looking more at the player than the team. Both are fascinating if you're interested in the NFL. What does Nate Jackson bring to the story that you wouldn’t experience if you just read the book? It's a real bonus to have Nate Jackson reading the book. His engaging personality really comes through. Would you listen to Slow Getting Up again? Why? Nate Jackson provides a very clear picture of what life is like for a professional football player, from the pain of a torn muscle to the availability of "jersey chasers" for a pro athlete. He peppers his story with more philosophical meanderings and extended metaphors than you might imagine, but it's largely an instructive, interesting, informative inside look inside the locker room. Though this is, lively and nforming, as in my headline above, it is also a bit too vulgar at points for me. That may strike many as backward these days, but that is my opinion. I have no idea how this book gathered a 4.2 rating. I wanted to like it. I love the sport and enjoy peeking behind the curtain as it were . . . but was there no editor for this book? The writing was junior high awful---to the point where I almost stopped listening. Also, authors really need to learn that just because it is their "story" doesn't mean they have the acting and voice skills to convey it audibly. This book would have been helped tremendously by a professional reader/performer and a real editor. A difficult book to endure despite enjoying the topic. I almost didn't make it. The story is great. The truths are greater. This book hits on all the highs and lows of professional sports. The guts and glory of being able to achieve a childhood dream in front of family, and the struggle the athletes face. Injury, narcissistic coaches, good coaches, twisted priorities of the machine that drives sports, doctors push for short term solutions to long term problems and the inevitable crawl towards the end of a career based on one's durability and youth. This has given me the extra dose of empathy many people need these days with fantasy sports clouding the life and health behind each player. Too often have heard, "(insert player here) is hurt, that's good for my fantasy team," with the callus disregard of a living, breathing, and feeling person having their dreams walked on by injury. Thank you, Nate, for sharing your struggle and painful journey through the gauntlet. A wonderful look inside the NFL from a journeyman! A little rough on the delivery, but at least HE told HIS story, rather than having someone else narrate it. Can't wait to start his second book! Great perspectives from a very good writer. Who would’ve thought a football player could be such a good writer (there i go with stereotypes addressed in the book)? Entertaining book for any football fan or any observer of American culture. I bought this knowing virtually nothing about football or the NFL but wanting to know more: mission accomplished. You don't need to know much about the game to enjoy this. Well written yet uncomplicated, it will challenge any preconception that you may have about NFL players being bone heads with an IQ lower than their shirt numbers: the author's documentation of his changing relationship with a ame he once loved is wise, enlightening and will sound familiar to many a sports fan. It's also funny, down to earth, easy going stuff -well worth a listen for NFL lovers and fans of other sports alike.